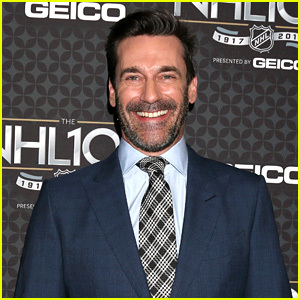 Jon Hamm hits the red carpet while attending the 2017 NHL 100 Gala on Friday night (January 27) at the Microsoft Theater in Los Angeles. The 45-year-old actor hosted the event during NHL All-Star weekend and other celebs in attendance included Alyssa Milano, Clive Standen, Michael J. Fox and wife Tracy Pollan, Isaiah Mustafa, and Keltie Knight. Cuba Gooding Jr., Pia Toscano, and Chloe Bridges also stepped out that night at the NHL All-Star Party presented by Sky Diamonds and CNC Motors, Inc. to benefit Children’s Hospital Los Angeles. Jon opened up that night about why he doesn’t like to watch old episodes of his Emmy-winning series Mad Men. “No, I watch myself enough, I don’t need to. I don’t sit at home and obsess,” he told Us Weekly. Giuliana Rancic, Mario Lopez, & TV Hosts Kick Off Emmys 2016 Red Carpet! Giuliana Rancic wears a cape on the red carpet while attending the 2016 Emmy Awards held at the Microsoft Theater on Sunday (September 18) in Los Angeles. The E! Live from the Red Carpet host was joined at the event by lots of other television hosts, including Mario Lopez. Other TV personalities in attendance included Keltie Knight, Nancy O’Dell, Charissa Thompson, Renee Bargh, Liliana Vasquez, Debbie Matenopoulos, Louis Aguire, Liz Hernandez, Lawrence Zarian, Porsha Williams, Ross Mathews, and Zuri Hall. FYI: Giuliana is wearing a Georges Chakra Couture dress. Mario is wearing a Samuel Sohn tuxedo. Keltie is wearing a Jovani dress and Michael John jewelry. Liliana is wearing CSARITE by Katie Diamond earrings and ring and CSARITE by Dawes Design rings. Liz is wearing a House of CB dress. Charissa is wearing Loriblu sandals. Kaley Cuoco is red hot in a cutout dress while attending the 2016 A Night at Sardi’s benefit for the Alzheimer’s Association at The Beverly Hilton Hotel on Wednesday night (March 9) in Beverly Hills, Calif. The 30-year-old actress was joined by her co-stars Jim Parsons, Simon Helberg, Johnny Galecki, Mayim Bialik, and Kunal Nayyar. Also in attendance that evening were Sarah Rafferty, Keltie Knight, Peter Gallagher, Dan Bucatinsky, Jason Alexander, and Eric McCormack. FYI: Kaley is wearing a Naeem Khan dress, Jackie Aiche jewels, and a Jimmy Choo bag with Randall Scott Fine Jewelry earrings. Sarah is wearing a Tadashi Shoji dress. Maria Menounos sparkles in silver while arriving for the 2016 Academy Awards held at the Dolby Theatre on Sunday (February 28) in Hollywood. The 37-year-old red carpet host was joined by fellow TV personalities Keltie Knight, Louise Roe, and Stephanie Bauer. “Join me on snapchat for behind the scenes of #oscars,” Maria tweeted. FYI: Stephanie is wearing a Portia & Scarlett dress. Maria is wearing a Christian Siriano dress, Jimmy Choo shoes, and Lorraine Schwartz jewelry. Louise is wearing a Christian Siriano dress, Jimmy Choo shoes and clutch, and a Maison Martin Margiela from FWRD necklace. Giuliana Rancic Is the Golden Girl at Grammys 2016! Giuliana Rancic hits the red carpet in a golden down at the 2016 Grammy Awards held at the Staples Center on Monday (February 15) in Los Angeles. The 41-year-old television personality is hosting the E! Live from the Red Carpet special this evening alongside Ryan Seacrest. Other television correspondents on the red carpet included Carly Steel, Keltie Knight, and E!’s Ross Mathews. FYI: Giuliana is wearing a Jani Khosla dress and Tamara Mellon shoes. Carly is wearing a Gauri and Nainika dress with Neil Lane jewelry.